A Review of Helen Marshall’s Hair Side, Flesh Side (ChiZine, Forthcoming November 2012). Cover Photo courtesy of the publisher. Helen Marshall’s Hair Side, Flesh Side is a textual body in itself. Each of the short stories contained in the volume is named after a body part, and her work focusses on the body as a textual entity, as something that is written upon, written about, and that writes itself. She shows a fascination with defamiliarising the body, making the body (once something familiar and known) into a foreign territory full of questions, ambiguity, and terror. The reader is hyper aware of their body at the same time as they are driven to question its very nature. Helen Marshall’s passions as a scholar of antiquated texts comes through in her stories, illustrating a passion for ideas of past and memory. Her characters are haunted by the past, objects and bodies from the past infiltrate the modern, texts from beyond the grave write themselves on the living, researchers are haunted by past atrocities. Marshall illustrates that the past is only buried by a thin layer, a skin of present-hood that contains a deep, living body of history. Memory is something that haunts the living, returning and reminding us of things that have been lost, buried, or broken. Objects, physical things, come to embody memory and hold feeling in Marshall’s work, and the body is an object that is inscribed with layers of experience. People are manuscripts of memory. Hair Side, Flesh Side encompasses a wide variety of stories and is not bound by one genre, but rather the general “Weird” category that orbits around Science Fiction, Fantasy, Horror, and all of the genres in between. Marshall illustrates her strengths in each of these genres. The stories in this volume vary around the theme of the unfamiliar. A man is compelled into a perpetual flight due to his fear of home and settling, the ghosts of dead authors haunt living experiences, speaking to and acting through modern bodies, a woman exists only at the moments that others approach death, angelic narrators of death are forced to question the permanence of things and the lack of narrative in God’s plan, the social desire for perfection results in mass transformations into statues, the desire to consume runs rampant and becomes a vehicle for change, hearts torn out in mourning return to haunt the melancholy, ghosts seek oblivion in the urban rush, things forgotten fade, and skin is written upon, haunted textually by the past. Death, memory, forgotten things, and the past are always writing themselves on our experiences. Marshall illustrates for her readers that death is an ever-present part of life, haunting us in memory of place, relationships, bodies, and objects that surround us. To read more about Helen Marshall’s work, visit her website at http://www.manuscriptgal.com/ . To explore Hair Side, Flesh Side, visit ChiZine at http://chizinepub.com/ . 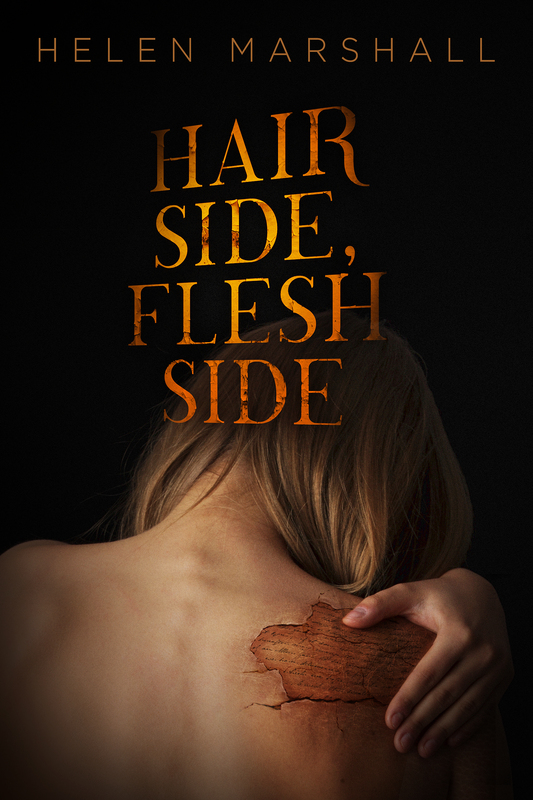 You can also check out the website for Hair Side, Flesh Side at http://hairsidefleshside.com/ to check out the book in detail. This entry was posted in Fiction Book Reviews and tagged Angel, body, ChiZine, death, forthcoming books, ghosts, haunted by past, haunting, Helen Marshall, Horrify Your Halloween, horror, manuscript, memory, reviews, text, Weird Fiction, writing.